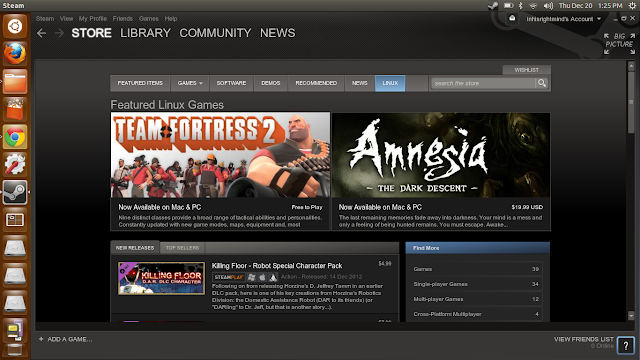 Steam for Linux Beta is Now Open to Everyone! Nobody in their right minds would have imagined this an year ago. An officially supported Steam client for Linux? Are you kidding me? Well it just happened and the official Steam client for Linux is open to public. We should especially thank Microsoft for shooting its own feet with their new App Store style "one marketplace to rule them all" strategy for Windows 8. Linux - Fixed excessive CPU usage by the Steam client when running Team Fortress 2. Linux - Fixed overlay crash when starting Cubemen. Big Picture - Improved back navigation behavior throughout user interface. Big Picture - Added discount timers and other user interface to store.